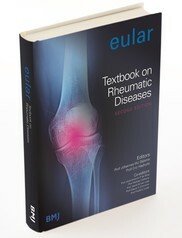 The EULAR Textbook on Rheumatic Diseases found its origin in the successful EULAR On-line Course on Rheumatic Diseases. Its yearly updated reviews of the total of fifty modules form the content of this book. For a balanced view, each chapter is written by two dedicated expert rheumatologists from two different European countries. Most of them are assisted by a junior doctor or researcher from their own department in order to stimulate a focus on modern educational goals and techniques. The fifty chapters, brought together in this book, encompassing the whole spectrum of rheumatology, form a vital part of rheumatologists' continuing medical education, keeping doctors up to date in daily practice. as well as a limited number of key references. It is the intention of EULAR to publish new editions of this Textbook at regular intervals, not as frequently as the On-line Course, which is refreshed every year, but once every three years. Therefore comments from readers of this Textbook are very welcome (education@eular.org) and will be taken into account for the next edition. List of additional references per Textbook chapter. Price of the book: EUR 155 plus shipment (EUR 30). Discounted Textbook price for low and middle income countries with GDP below 10'000US$: EUR116 plus shipment: Please refer to official list.